Consequently, you’ll understand why I got just a little excited when I checked out the website of The Original Sofa Co., a company – based here in Gateshead – that specialises in Chesterfield sofas and chairs, and is a new CannySites.com client. Its homepage features a slide show of stunning photographs, placing the company’s products in a succession of surprising and sometimes familiar locations. 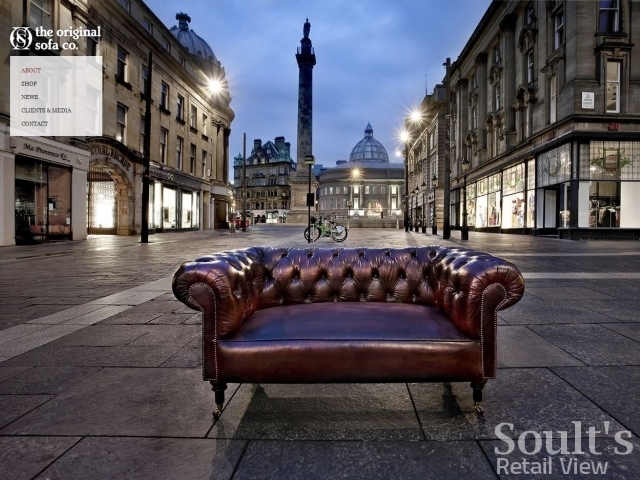 However, it’s the image of a Chesterfield sofa in the middle of Newcastle’s iconic Grey Street (above) – named, back in 2010, as one of Britain’s most picturesque streets – that arguably brings the biggest ‘wow’ factor. 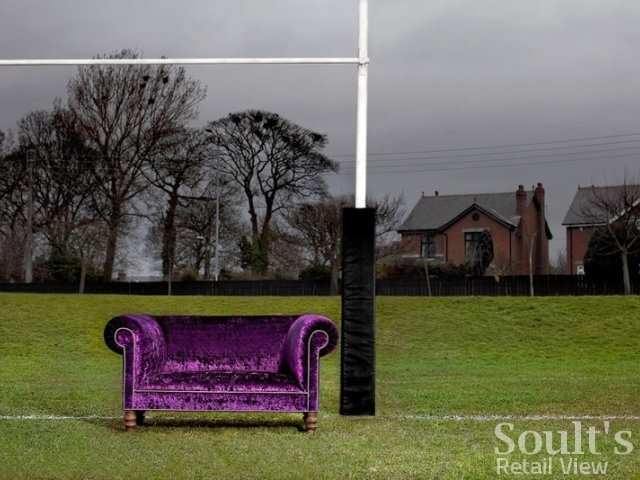 One of The Original Sofa Co.’s homepage images. Photograph courtesy of The Original Sofa Co. The overall effect of this bold imagery is to immediately create an impression of a brand that is elegant and high quality, yet also quirky, creative, and proud of its North East roots – and very different to the average furniture retailer, where the homepage is typically packed with products, offers and an overall message that is all about selling rather than the brand. 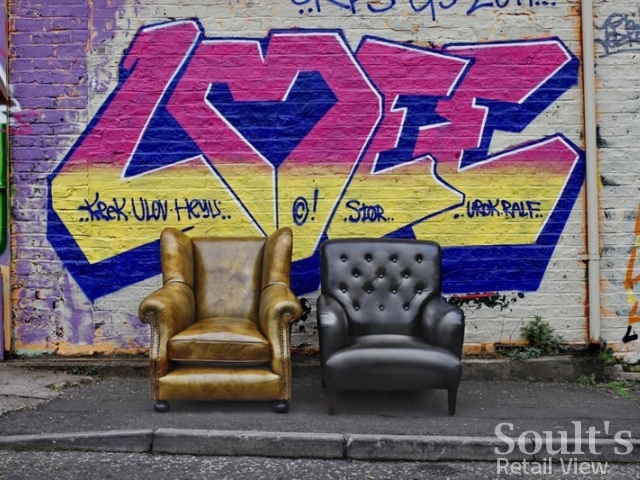 Instead, through the use of carefully chosen and innovative images, The Original Sofa Co. tells its target customers much more about what makes the company tick than could be achieved through any amount of text and product images. So, my interest piqued by a business that is not only doing exciting things with its website and brand, but is also located just a mile down the road, I spoke to The Original Sofa Co.’s founder and MD, David Robinson, to understand a little more about the business’s fascinating origins, the multichannel approach at the heart of its success to date, and the firm’s ambitious plans to make a global impact from its base in Gateshead. Q. Tell me a little bit about your business – where is it based, what’s its history, and what does it do? We’re based on Team Valley’s Retail World in Gateshead and we’ve been around for almost 12 years now, but our philosophies and principles are literally hundreds of years old. I inherited a Chesterfield sofa back in 2001. It wasn’t in the best quality or in the greatest of conditions, so I looked into what I could do to restore it. My first Chesterfield restoration was soon snapped up by the local golf club, so I bought another one. A few Chesterfields later, I became more and more intrigued by the history of these iconic sofas: the crafting methods, skills and products that were used to make the very best of these pieces that were literally lasting of years. And so, it was these incredible crafting methods that I replicated to form The Original Sofa Co. Ltd.
Q. And what’s your own role in the business? I would say I’m not your conventional Managing Director. I’m not averse to donning a pair of latex gloves and spending a few hours hand dying one of our beautiful sofas. That said, I’m always looking at ways to develop, and often find myself on the phone or brewing a coffee ahead of a meeting. It’s definitely a team effort in the company. Q. What’s your business model, and why? Is it bricks, clicks or both? Definitely both. Since we opened the brand new showroom we have had people through the door that have travelled unimaginable distances. From South Korea to Italy, Glasgow to Bournemouth, people visit us because of the unrivalled quality and skills that we consistently deliver, but most of all, because they can see it all happening for themselves in our showroom and workshop. That said, for the moment at least, the clicks do look after the bricks in terms of percentages. Our larger proportion of revenue comes through online, so because of that we’re extremely passionate about having a great visual website to do our products justice. We use some stunning real-life photography (no Photoshop), quirky product descriptions and inventive news, and I believe we achieve exactly that! Q. Looking forward, what do you see as the greatest opportunities for a business like yours at the moment? Certainly by the end of this year, we will open our London showroom. This will mean that we have two localities for our worldwide customers to visit and experience our products; however, production will certainly remain rooted here in the North East. We have found that people today are looking for quality after years of mass production, shotgun manufacturing and substandard products. People want furniture that will not only look beautiful but also offer longevity, so if we can build our brand and really rubberstamp our products in the market, I predict a joyous future for ourselves and our consumers. Q, And what about the main challenges? One of our biggest challenges is distinguishing us from competitors. You see, there are Chesterfields, and then there are CHESTERFIELDS. If a sofa has a deep buttons and is upholstered in leather, is that a Chesterfield? Originally, a Chesterfield is a piece of furniture that is completely crafted by hand. It’s built using a solid frame, fully coil sprung, fully hand tacked – no staples – and filled using horsetail. It would be hand dyed and individually hand studded. It’s a piece of historical art that would literally last centuries which is why there are still 250-year-old pieces on the market now! Of course, no matter the industry, if it’s good and it sells, then there are always cheaper versions, but are you getting the full package? 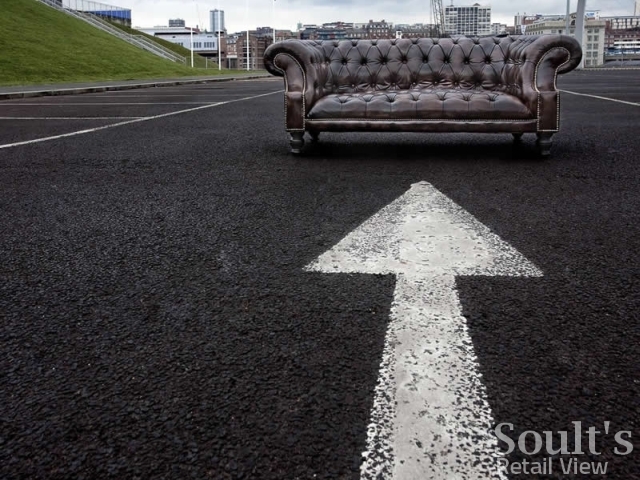 For us, our challenge is to get the message out there that The Original Sofa Co. Ltd isn’t just another Chesterfield manufacturer. We craft, and we craft quality that honours the origins of the famous Chesterfield name. Q. Where do you hope your business will be in five years’ time? We don’t shy away from ambition here at The Original Sofa Co. Ltd, and in five years time I would hope to have our two UK showrooms (Team Valley and London) operating fluently, a showroom in New York, and possibly a fourth showroom in the far east, perhaps Beijing. We’re constantly inundated with requests from businesses around the world wanting to feature our furniture, and we recently featured in the famous Wall Street Journal, so this type of exposure can only help our cause. So with the plans in place for future showrooms and the regular additions to our commercial partnerships, I am without doubt that there’s only one way that we can go, and that’s forward. Q. And any final thoughts or comments that you’d like to add? Only that I’m extremely proud of what we do at The Original Sofa Co. We’re a very closely-knit team and we all pull together in order to make the model work. From Matty and Les, our talented upholsterers, who do such a sterling job with our furniture, Simon our brand guy who is constantly developing our online presence, Maria, my dedicated mother and chief organiser of everything, to Bob our chief domestic man – we’re all in this together and we all truly believe and share passion for the products we are producing on a daily basis. From the moment you cross the doorway into the showroom or click onto the website, we’re always keen to help and offer a very personable service designed to meet everybody’s needs. We’re all about you, it’s as simple as that. Oh! And, well, we look forward to crafting your furniture very soon! Retailer Q&A is a format where Soult’s Retail View talks to retailers – large or small, and whether bricks, clicks or multichannel – about their current innovations, aspirations and challenges. 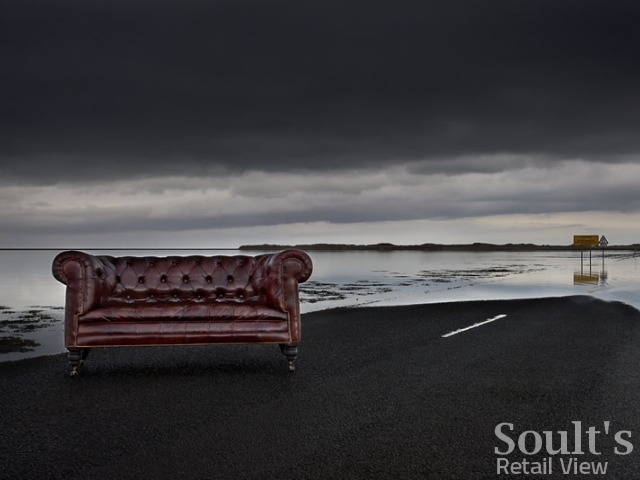 As always with Soult’s Retail View, the features are not paid for – it’s all about providing interesting stories and content for the blog’s readers. If you run a retail business and are interested in taking part in the feature, please drop me an email or a tweet. Remember, my retail consultancy business, CannyInsights.com, also works with retailers nationwide to improve their stores, customer communications and market knowledge. For more information, visit www.cannyinsights.com. Tags: BeijingCannySites.comDavid RobinsonGatesheadGrey StreetLondonNew YorkTeam Valley Retail WorldThe Original Sofa Co.